The Woman in Black Review By Alfonso Cosenza Upon the arrival in London my anticipation was high. My first impression of the Fortune Theatre was; it was a very old Victorian building, very small and slightly ragged. Upon entering it felt very cramped and made you feel claustrophobic. The atmosphere was eerie due to the old style of the building. This was particularly effective as the play was set in the Victorian period. This made you feel as if you were in the past. Also the narrow staircase and small seating area created effect. Before the play starts there is no background music played to set a scene or image in the audiences mind. The play starts without warning and lights go down and we are straight into the story. 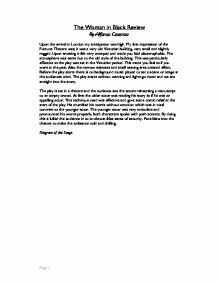 The play is set in a theatre and the audience see the actors rehearsing a manuscript to an empty crowd. At first the older actor was reading his story as if he was an appalling actor. This technique used was effective and gave some comic relief at the start of the play. He mumbled his words without emotion which was in total contrast to the younger actor. The younger actor was very articulate and pronounced his words properly, both characters spoke with posh accents. By doing this it lulled the audience in to an almost false sense of security. Fans blew into the theatre to make the ambience cold and chilling. Diagram of the Stage The audience were seated in front of the stage. ...read more. The main way sound was used was to build up a climax. A recorded sound of a rocking chair would always represent a terrifying image about to appear; the Woman in Black. We would associate sounds to images. It was an almost psychotic repetitive noise, which at first time of hearing may not have been distinguished as anything important. Another petrifying noise was an ear piercing, frightful scream. It sounded like it was made by someone in the utmost agonising pain who had gone insane with rage. It most certainly made the audience jump as it was played very loudly at an unexpected moment. However I considered it to be more than just a short fright. The sound was very disturbing. The way in which it died out gently also made you wonder what the person making it was feeling. It conjured up an image of someone who could not cope with what was happening to them. They let all the rage out in one long blast. It was played a number of times, each very chilling. It did not lose the effect, as it was played unexpectedly each time, thus you heard it in another situation and dimension. The other main recording was of a horse and trap coming slowly to a halt and then crashing. This is played at the end of the play and is a backbone to the plot. It is an equally disturbing noise not one you would chose to listen to regularly. ...read more. After saying how effective sound was in this play I think the lack of it was more effective. The long silences followed by a noise or person would always make you jump. The silences would always build the suspense and get you ready for something bad to happen. After the loud, unexpected sounds there were many long pauses, which added to the sinister atmosphere. In my opinion this was the most effective use of sound. By the end of the play there was still a disturbing ambience as I walked away. I had thoroughly enjoyed the play and was suitably scared. Any more and I may not have been able to sleep. I took away many aspects of acting, which could be useful in the future. The use of silence and torches in the darkness were some of my favourites. The play was enjoyable and funny but also terrorizing. One of the most amusing parts was the dog spider scene. This was hard to act as they were pretending there was a dog but it was done with the utmost ease. It was funny how the older man kicked the dog saying "it does what I say". If I was a critic for a magazine my short caption would read; "The Woman in Black" is a play with a distressing plot, of ghastly ghostly terror. Set in the Victorian times it sends a feeling of emptiness and solitude through you, nevertheless an obvious first choice for taking the young ones to see, to appreciate and learn from the immaculate actors and use of stage crew! ?? ?? ?? ?? Page 1 ...read more. The costumes worn were plain, all black, but different styles. I think this coincides with the chair situation of being different, having different personalities and wanting different things in their lives. The aprons worn are all the same but this is to show that they all work in the same place but the tops however are assorted. > Opening~ lots of movement, pace + energy~ got the audience involved, used appropriate language etc to link with the audience, to gain a close relation ship. > Use of pause and quick change in pace in more serious scenes eg.when keys were handed over to Judy, very effective. The use of the smoke machine allowed the audience to experience the feelings of Mr. Kipps as the smoke completing obscured the view of the stage. This meant that the audience began to breathe a lot heavier than before because they were unable to see what was happening allowing things to happen that they were unaware of. As he does so he has a torch and with this torch he shines it round so that the audience is submitted to glare from a bright torch in already near pitch black darkness, this makes the darkness all the more blacker and illuminates what the audience really does not want to be illuminated. The choice of music and sound, from technical director Ben Sehovic was superb. 'A Flea In Her Ear' is a piece of drama that does not require a lot of music or sound, if any. Yet the small sound effects, added at certain intervals, added a great deal of emphasis to the play. In my perspective I feel it presented a clear perspective of each character. The contrast in class was clearly shown from the start of the play. The accents the characters consisted off allowed us to make a judgement on where they fit into society. Jean is suspicious of her possible intentions; that they should both to become not-sober. I gestures my uncomfortableness with a cough and my face drops into an expression conveying dread. Julie furthermore states that she wishes for Jean to kiss her shoe.